"Another municipal counsellor, John George Eastman attended his first council meeting on the 13th August 1931, remained a very active member until illness overtook him in 1957, and thenceforth retained his membership until his passing at the age of 90 years on the 23rd January 1959. He was President in 1933 and Honoury Treasurer for most of his time on council. A nephew, Herbet. P. Eastman, was appointed caretaker of the school on the 24th February 1941, a position which he held for more than 37 years, with the only interruption being for service in World War II. Bert's Father (John's brother) also served the school on a part-time basis for a number of years, and the family connection continued with Bert's niece Mrs. Elaine Parsons who had been the Principal's/Director's Secretary from 1974 to 1988." 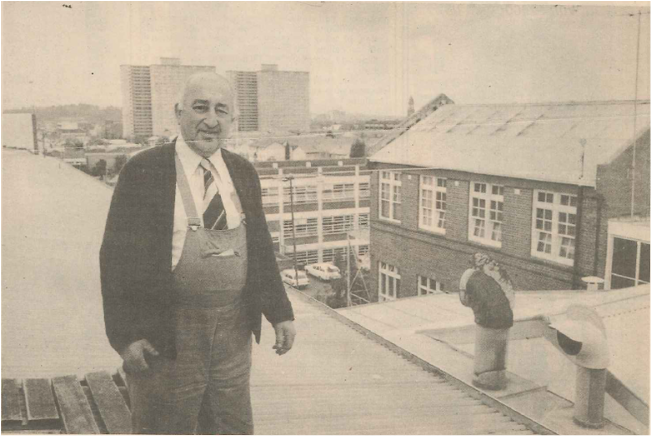 Herbert Percy Eastman II aka Bert was the Caretaker of Collingwood Technical College for 39 years. Bert lived on the premises with his wife Betty Eastman and daughter Leonie until his retirement in 1978 upon which the family moved to Diamond Creek. The following article was published in The Melbourne Times at the time of Bert's retirement. Article courtesy of Daughter Leonie, and his Granddaughters Ainsley and Aleisha Marston. the furniture with six men. He's glad to be leaving the "asphalt jungle" where more than 1000 students used the buildings from early in the morning to nearly 10pm. "I've never had a day off so they must owe me months of sick leave. But I suppose it would have been hard to take a day off when you live-in on the job." Plus, there was always the thought that 700 junior school-boys would arrive every morning. Now only 300 arrive but Bert says they are cheekier these days. In the early years the people studying trades at night school would roll up on their bicycles and he would charge a penny each for looking after them. Today the night students drive cars into the Tech yards. "But Collingwood is still a quiet place. Even on a Saturday night you could fire a gun down Wellington Street without hurting anyone." But at least he has never had to buy a pair of boots from a shop. He has been a good customer of the tech boot trades department for the full 39 years. 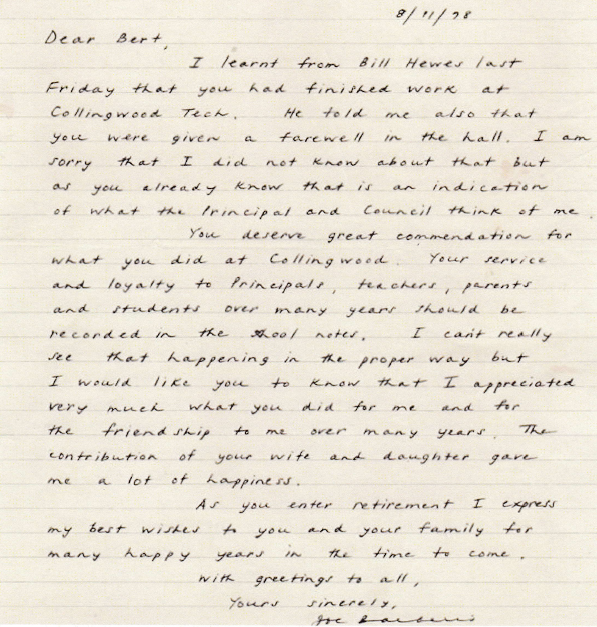 ​1978 CTC Letter from ex Principal Joe Barberis to Bert Eastman on Bert's retirement. Courtesy of ​Mr. Eastman's daughter Leonie Marston.